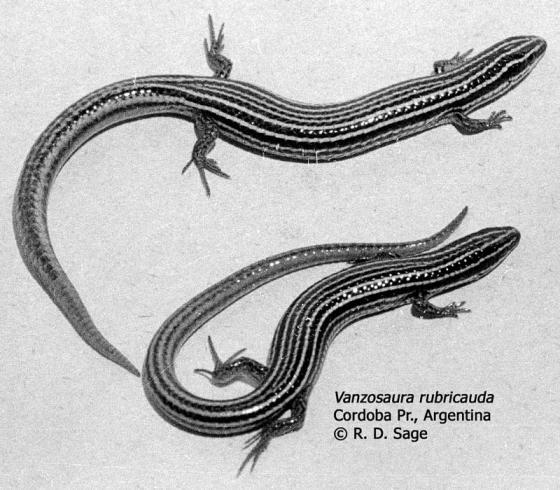 Can you confirm these amateur observations of Vanzosaura rubricauda? Type locality: Cruz del Eje, Córdoba, Argentina. Types Type: BMNH 1946.8.2.22 (and possibly additional specimens). Comment Type species: Gymnophthalmus rubricauda BOULENGER 1902 is the type species of the genus Vanzosaura RODRIGUES 1991. For a definition (in Portuguese) see RODRIGUES 1991: 335. Synonymy: Gymnophthalmus multiscutatus AMARAL 1932 has been revalidated from the synonymy of Vanzosaura rubricauda by RECODER et al. 2014. Etymology The generic name is a homage to Dr. Paulo Emílio Vanzolini (1924-2013), one of the most distinguished Brazilian zoologists. About Vanzolini see Heyer (2004), Bastos & Sa 2011, and Dirksen 2013. The specific names is derived from Latin “ruber” = red, and “cauda” = tail, for its red tail. Dias, E. J. R. & Lira-da-Silva, R. 1998. Utilização dos recursos alimentares por quatro espécies de lagartos (Phyllopezus pollicaris, Tropidurus hispidus, Mabuya macrorhyncha e Vanzosaura rubricauda) da caatinga (Usina Hidrelétrica de Xingó). Brazilian Journal of Ecology 02: 97-101. Gonzáles, L. 1998. 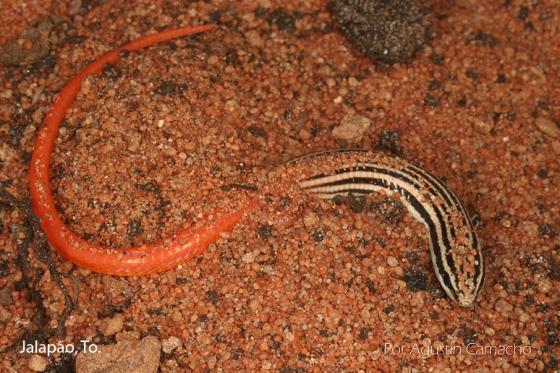 La herpetofauna del Izozog. Ecol. Bolivia 31: 45-51.